Steve Williams reckons his old boss got away with it. TIGER WOODS’ EX-CADDIE Steve Williams has weighed in on Tiger’s illegal drop controversy in an interview with 3News in New Zealand. Tiger wasn’t disqualified because of a new rule that allows officials to keep a player in a tournament and retrospectively give him a penalty if a violation is discovered via video replay. So that’s the rule that Williams said he doesn’t understand. 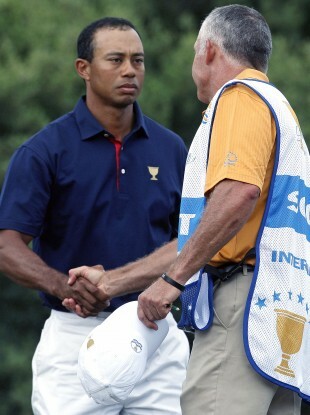 He and Tiger had an ugly breakup in the summer of 2011. And after winning his first tournament with Scott, Williams infamously said, “It was my aim to shove it up that black arse—-.” He later apologised, but it’s clear that Tiger and Williams are still far from friends. Email “Tiger Woods' ex-caddie says he should have been disqualified from the Masters ”. Feedback on “Tiger Woods' ex-caddie says he should have been disqualified from the Masters ”.